Plan ahead to let the steak marinate at least two hours before cooking. Place steak in glass baking dish. Whisk oil and next 5 ingredients in small bowl to blend. Pour half of marinade over steak. Turn steak over; pour remaining marinade over steak. Cover and chill at least 2 hours and up to 1 day, turning occasionally. Prepare barbecue (medium heat). Remove steak from marinade; shake off excess. Place steak on barbecue; cover barbecue. Grill steak to desired doneness (until instant-read thermometer inserted into center of steak registers 115 F to 120 F for rare, about 15 minutes per side, or 125 F to 130 F for medium-rare, about 18 minutes per side), occasionally moving steak to cooler part of rack if burning. Transfer steak to platter; cover to keep warm. Let stand 5 minutes. Using sharp knife, cut meat away from bone. Cut each meat section into 1/3-inch-thick slices. Spread Paprika-Parmesan Butter over top of slices and serve. 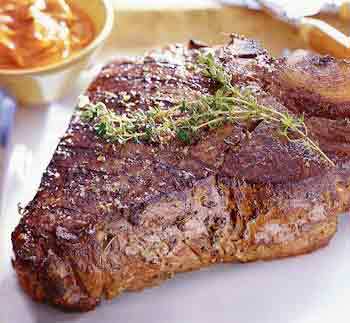 Omaha Steaks - premium heartland quality steaks and meats. The Porterhouse, “The King of the T-Bones”, boasts a plentiful portion of tenderloin. It’s like having an entire Filet Mignon and Strip Sirloin on your plate!